“What is your greatest struggle with prayer?” That’s the question I’ve asked hundreds upon hundreds of people, and a striking majority have replied with the exact same struggle. We all love the idea of prayer. Many of us have had positive experiences with prayer. We generally want to pray more. Once we sit down to pray, our minds spin out of control with thoughts of anything but prayer. Our minds wander, worries assault our peace, and any hope of focus dissipates. Perhaps we turn to making requests or sharing thankfulness to God, which are good things, but any kind of peaceful contemplation, waiting on God in silence, or listening for God to speak appears to be a hopeless endeavor with so many ideas, voices, and fears screaming into our minds. I’ve often spoke of prayer in terms of God showing up, as if I’m doing my job 100% perfect and any problems with prayer are on God’s end. In my experience, that’s a pretty fast way to turn into an atheist. If you do your part and you don’t sense God’s presence while praying, then clearly the problem is coming from God, right? The Christian contemplative prayer tradition offers a corrective we need: God is always present. God loves us. The awareness and presence required is our own for prayer. Note that Jesus often speaks in the Gospels of people “coming” to him. He has issued the invitation to us. The problem isn’t on God’s end. Remember, in the Prodigal son story, the father is waiting for the son’s return and was so eager to welcome his lost son that he ran out to meet him. God is here for us when we pray, and so we need to figure out where distractions and other obstacles in prayer come from and how we can move beyond them. How can distracted people make themselves present for a loving God? Until I confronted my distractions, I didn’t know that I was distracted in the first place. Until we stop to face what’s running through our minds, the constant thinking and worrying of each day continues unchecked. Too many Christians have resisted mindfulness practices because they fear connections with eastern religions, but mindfulness practices can be traced right back to the desert fathers and mothers of the church. Even secular psychology praises the benefits of simply becoming aware of what’s on your mind and becoming present in the moment. It’s nearly impossible to sit down to pray with any kind of focus if you haven’t first taken stock of what’s on your mind. This is why the Ignatian Examen is so incredibly helpful. We can take stock of the highs and lows of our days, confront our worries, and enter into prayer by preemptively facing the very thoughts that could distract us. This is a process. Richard Rohr suggests that the first year of practicing contemplative prayer largely deals with the junk in our minds. We spend so much time reliving our regrets and fearing the future that we are untrained in the practice of seeking God in the present. Even if we can face our distractions and bring our troubled thoughts to God, there’s still the matter of where to begin. Should we make requests, offer thanksgiving and praise, or sit in silence? These are all practices that we can use, but for those of us struggling with anxiety about God actually showing up in prayer, the best way forward for a season may be the path of silence. We should certainly speak our minds to God, but if we don’t have the assurance of God’s loving presence right from the start, silence may save us from trying to coerce God to show up. God is already present when we pray, but it’s so easy to start saying things that suggest otherwise. Centering prayer teaches us to calm our anxious minds by asking the Spirit to guide us to a “prayer word” or phrase that we can use to quiet ourselves before God so that we can wait patiently on the Lord. Beginning with this simple word can help us grab onto something as a starting point so that we can return to God in silence again and again as our minds wander. When I have spoken of God showing up, I’ve also had fairly specific expectations of feeling or knowing God in some particular way. I know that plenty of people have had experiences of God, while others with an indisputable commitment to God more or less sit in silence for most of their prayer time. Our expectations for prayer can trap us and alienate us from God. Ironically, the contemplative writers of the church assure us that we need to set our expectations far lower for prayer. Seeking God in the first place is prayer. Sitting in silence before God is prayer. God honors even our intentions as we struggle to focus. These are the teachings of the masters of contemplative prayer. Rather than pushing us to reach some particularly high goal, they tell us that our beginning struggles are holy offerings to God, and we can trust that God will continue to guide us forward. Most importantly, we pray in order to become present for God. We “experience” God on God’s own terms, and so any expectations for prayer can be harmful. I have longed for mystical encounters and experiences, but the contemplatives of the church remind us that this can be dangerous. Seeking an encounter with God is not the same thing as seeking God. This desire highlights my insecurity and perhaps even my pride. While we must learn from the guidance of spiritual directors, authors, and practitioners who have gone before us, we also have to seek God for ourselves and take what is given to us without envying the experiences of others. This has been my pitfall for years. I have looked at the ways other people experienced God and longed to imitate them. We are always looking for ways to validate ourselves, and while prayer can become the answer to that search, we dare not misuse it. Prayer helps us see how deeply God loves and accepts us, but we can only receive that gift in the timing and manner that God chooses. I have seen over and over again that God chooses different timing and a different manner for each person, even if there are some general trends and patterns that can be observed. Here is the good news that you need to know about prayer: Struggling with distraction during prayer is 100% normal, and there is hope. The contemplative prayer tradition dates back to the earliest days of the church, even pre-dating the canon of scripture, and it has been preserved throughout the centuries as one way to move beyond distraction and to become present for God. The bad news is that overcoming distraction will take quite a bit of work. We even have to face the worries and fears that come up as we attempt prayer. 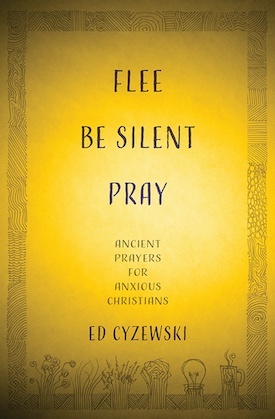 The author of the Cloud of Unknowing passed along this ancient Christian prayer tradition in his simple manual for novice monks, and he spends a significant amount of time addressing the ways that our thoughts invade our prayer much like visitors who barge into our homes repeatedly. By reciting a prayer word, phrase (such as a scripture verse) or returning to an intention for your prayer time, you can gently move these distractions out of your mind over and over and over again. For about the first six months of really exploring silence and contemplation, my mind was a complete mess. My thoughts flew all over the place. The only thing that kept me going was the fact that I had to take my son for a walk every day in order for him to nap, and I suspected that my busy mind was extremely unhealthy. Over time, I experienced greater peace and freedom, recognizing uneasiness and distractions for what they were and gradually building a capacity to be still before God. I like to say that I “practice” contemplative prayer because I still feel very much like a beginner and I don’t expect to get it perfect—not that getting it “perfect” should ever be the goal! We enter into contemplative prayer as equals who are all equally loved by God and who all commit to practice. So we pray, we struggle, and we continue to practice.